ECE has an in-house optical inspection station to improve quality and reliability of circuit board assemblies during the design process and manufacturing. ECE uses the optical assembly station to inspect circuit assemblies during manufacturing, to review assemblies after HALT (Highly Accelerated Life Testing) or HASS (Highly Accelerated Stress Screening), and to aid in troubleshooting during the prototyping stages. 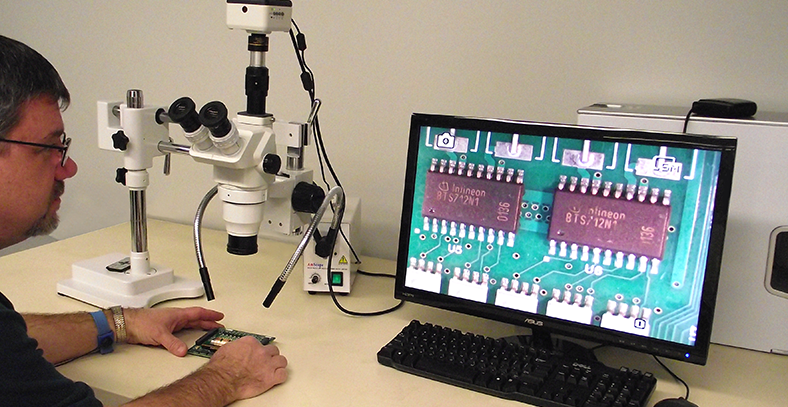 The PCB optical inspection station is utilized by ECE’s experienced ANSI-J solder instructor and Engineers to view, and document highly magnified images which helps detect even minor issues on the circuit board assemblies. The PCB optical inspection station is one of many tools that make ECE a truly comprehensive embedded system design and manufacturing company.